Guy Michaels grew up in the coastal community of Pacifica, California. He enjoyed woodworking as a young man, but pursued it only as a hobby. Although he had carved a couple of pieces on the lathe in high school, Guy didn't take up woodturning again until 1989. He was 29. This time, he recognized the emergence of a passion within him, and began sharing his pieces at art festivals in Sept. 1990. On a whim to weld his talents on a new medium, he placed a piece of stone on the lathe in the latter part of 1991. When the dust settled, a unique thing of beauty was left, an alabaster turning, so thin that light transcended it, so smooth and colorful, it begged to be caressed. Guy's passion had taken a new turn, and a part-time hobby was becoming a full time preoccupation. With so much demand for his rare and unusual pieces, he quit his job as a UPS driver and took to his workshop on a full-time basis. Now a full-time artist for over 25 years, Guy lives in El Granada, CA with his wife, Shawnya and his beautiful daughters, Chelsea and Hallie. ​​Guy takes enormous pride in creating each one of a kind piece, and if you find something in the portfolio that you like, please feel free to call us with your order or any questions. We also can create custom orders; call or email and let us know what you want. Enjoy looking around and thank you for visiting our site! Artist Guy Michaels has spent over 25 years perfecting a unique art form: Turned alabaster vessels inlaid with segments of exotic woods. 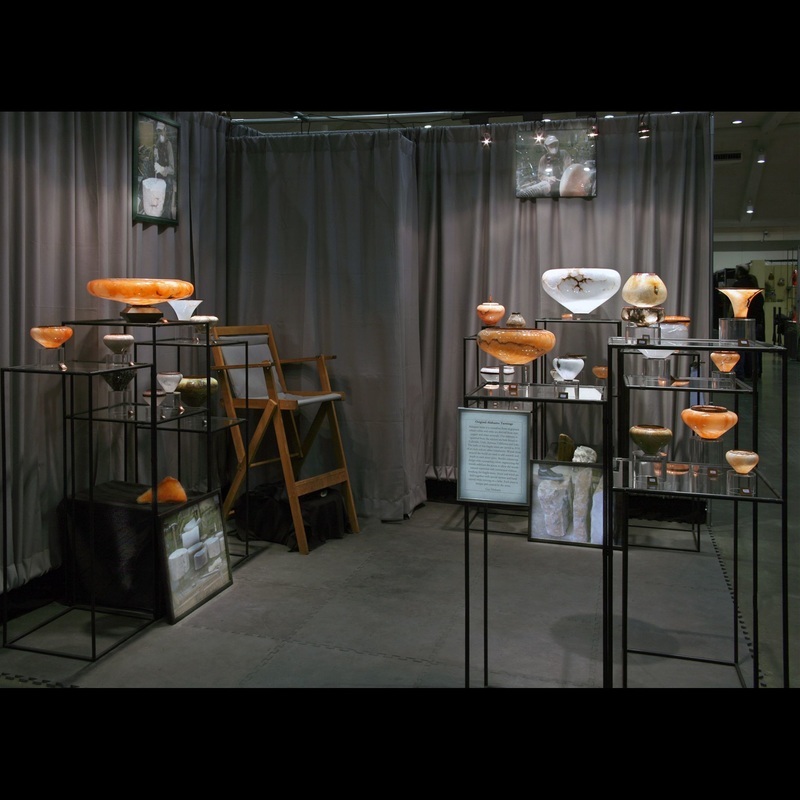 Each piece is a one of a kind since nature provides an endless supply of colors and patterns in each alabaster stone. Alabaster is becoming a rare stone with fewer quarries available to extract the stone. Choosing one of these unusual pieces will turn your home decor from ordinary into the extraordinary. His hand-crafted art has an inspiring beauty that draws from a variety of influences, including Old World, Native America, and natural elements. Guy starts with slabs of alabaster stone. 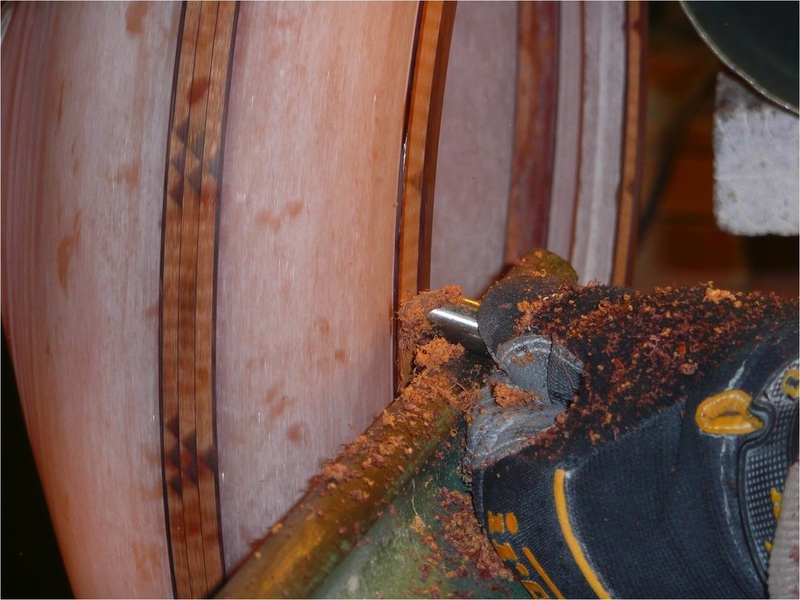 First, he roughs it into a round shape with an air chisel and attaches it onto a chuck that can be mounted on his lathe. 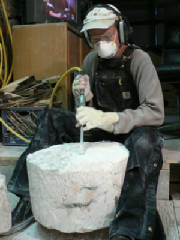 After roughing out the outer shape, Guy adheres segments of wood to the stone with a special adhesive process. The more layers of segments that a piece has, the longer that process takes, as each layer must dry in the special drying room for 24 hrs. Eventually, he mounts the pieces back onto the lathe. After turning the insides to 3/16 inches thin, the pieces are sanded smooth and a process of finishes is applied. It can take several weeks to make a single piece, but Guy typically works in batches, trying to meet the demands of galleries and individuals that are eager to own one of these unique vessels. If you're interested in carrying our products in your gallery, please contact Guy Michaels at: 650-726-1275. He will be delighted to explain our wholesale terms.